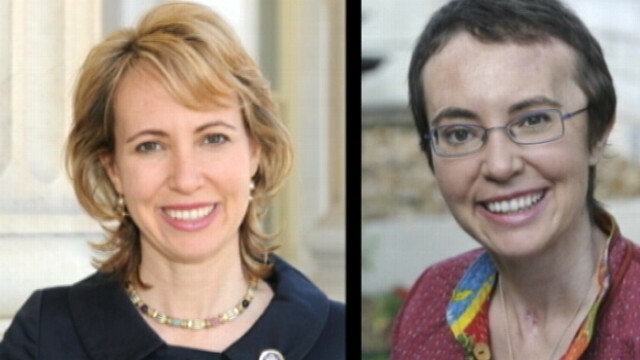 The first pictures of Rep. Gabrielle Giffords to emerge since a shooting in Tucson nearly took her life five months ago show a smiling face, along with signs of the hard recovery she has had to endure. The two photos, released on Giffords' public Facebook page on Sunday, were taken before the congresswoman underwent surgery to replace the bone on the left side of her skull that was damaged when she was shot in the head at a community event in Tucson in January. A slight indent in her skull, along with a shorter haircut, is evident in the photos. The Democratic congresswoman from Arizona has been undergoing rehabilitation at TIRR Memorial Hermann Hospital in Houston following the shooting at a Jan. 8 meet-and-greet event that left six people dead and 13 people injured, including Giffords. The milestone photos of Giffords were taken by a professional photographer one day after she marked another milestone in her recovery, traveling from Houston to Florida to watch the May 17 launch of the Space Shuttle Endeavor, captained by her husband, astronaut Mark Kelly. The photos are the public's first look at Giffords since April 27 when she was seen boarding a plane to Florida. The day after the shuttle launch, May 18, Giffords was back in Houston, undergoing the surgery to replace a piece of her skull. The injury Giffords received when she was shot in her left forehead led to brain swelling, which required the removal of a portion of her skull to relieve pressure. Giffords has improved enough that she is expected to be able to leave TIRR Memorial Hermann Hospital and continue therapy on an outpatient basis in the next few weeks, sources told ABC News on Saturday. "We're looking at before the end of the month. We're looking at early July," Giffords spokeswoman Pia Carusone told The Associated Press. "We don't have a date." Hidden behind the familiar smile of Giffords in the photographs, however, is the struggle the congresswoman continues to face to regain her previous level of communication. "Her words are back more and more now, but she's still using facial expressions as a way to express," said Carusone. "But, when it comes to a bigger and more complex thought that requires words, that's where she's had the trouble." But also behind Gifford's smile in one of the photos is a particular source of strength, her mother, Gloria. "I think Gabby derives a lot of strength from Gloria who has been just a real rock," C.J. Karamargin, Giffords' communications director told ABC News. "And I think they've become a lot closer throughout this ordeal. It's great to have that kind of support." Gloria has spent almost every day since the January shooting in her daughter's hospital room, according to Karamargin. It is expected that Giffords will remain in Houston to continue her rehabilitation as an outpatient, although it remains unclear exactly where she will be living. Her time as an outpatient in Houston will also give her time to make another important decision, whether or not she returns to Congress. If she wants to run for re-election, she would have to submit her candidacy papers 11 months from now, by May 2012. Jared Loughner is accused of opening fire at Giffords' Jan. 8 meet-and-greet event. A federal judge ruled Loughner mentally incompetent to stand trial for the mass shooting. ABC News' Gina Sunseri and The Associated Press contributed to this report.